EAST STROUDSBURG – On Friday, May 26, state Rep. Rosemary M. Brown (R-Monroe/Pike) surprised Carson Craig, a sixth-grader at Stroudsburg Middle School, who was selected as the winner of her 2017 “There Ought to Be a Law” contest. Brown’s annual contest is open to fourth- through sixth-grade students in school districts in the 189th District, and is designed to encourage involvement in state government and educate children about the responsibilities of a state representative. Each student was allowed to submit and explain one original idea for a new law in Pennsylvania. Carson has been invited to come to Harrisburg, as Brown’s guest, for a tour of the state Capitol. He is the son of Cheryl and Michael Craig. For information about any state-related issue, contact Brown’s district office in East Stroudsburg located at 143 Seven Bridge Road, by calling 570-420-8301. Information can also be found on online at RepBrown.com or Facebook.com/RepRosemaryBrown. Rep. Rosemary M. Brown (R-Monroe/Pike) is pictured here with Carson Craig and his parents, Cheryl and Michael Craig. 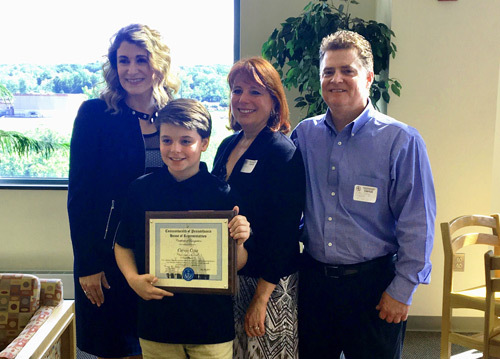 Carson, a sixth-grader at Stroudsburg Middle School, was selected as the winner of Brown’s 2017 “There Ought to Be a Law” contest. Carson has been invited to come to Harrisburg, as Brown’s guest, for a tour of the state Capitol.